We've seen NATO bicker with the Taliban, and even had Libyan rebels call in airstrikes in under 140 characters, but this has to be a first: Israel's announced its latest military offensive with a single tweet. After blowing up a car carrying Hamas bigwig Ahmed Al-Jabari, Israel told the world the attack is part of a larger campaign—"Operation Pillar of Defense." The IDF Twitter account then explained to its 66,000 followers the how and why of the campaign, citing self-defense, and claiming "All options are on the table. If necessary, the IDF is ready to initiate a ground operation in Gaza." In other words, Israel is prepared to start a little war here, and is spreading the word online. Maybe this seems glib—maybe it's inappropriate to kick off a thing that will end up with people dying over Twitter, your premiere destination for annoying tech blogger opining and tweens complaining about how much they hate dad. Maybe. 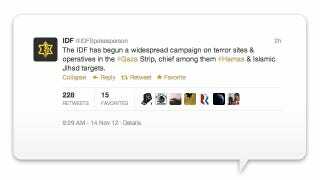 Update: Israel is now just straight-up livetweeting its war.